Here are some great elderberry recipes which can help you take full advantage of this wonderful plant, winter and summer! 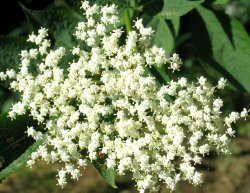 There's also a recipe for elderflower champagne for early summer. Picture above: Stripped elderberries: the birds got there first! Elderberry recipes - free health food from the countryside! 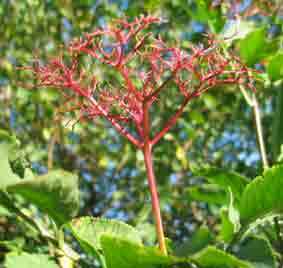 Elderberries are the fruits of the black elder (Sambucus nigra). There are different relations of this very useful plant in practically every country, world-wide. Here in Britain elderberry trees are regarded as a bit of a weed. A bit of a shame as elderberry fruit is one of the easiest free harvests around! You should check the properties of your local variety as to how edible the berries are. The berries of the European black elder are edible cooked but are not really trustworthy raw. However, once they are cooked they are a good source of vitamin C and iron. They are highly regarded by herbalists for their ability to ward off and treat colds and 'flu. They have anti-catarrhal and anti-inflammatory properties. Elderberries have as much as 5 times the amount of anthocyanins as blueberries! They even score better than cranberries for antioxidants. This has to give them the status of a superfood, in my book. So help yourself to some winter health by taking advantage of some elderberry recipes! First here's a classic recipe for elderberry cordial. If it looks just too much like hard work, or like me, you manage to miss the berries, there are elderberry concentrates and elderberry supplements such as "Sambucol" available in good health food shops and at Amazon. You can also find dried elderberries. Elderberries are noted for their medicinal properties. They also contain some indigestible elements so it's best not to eat them raw. However, use them in cookery and they prove to be tasty and even versatile. Here's the first of our elderberry recipes. Pick elderberries when they are fully ripe in early autumn. The bunches should be starting to droop downwards with the weight of the fruit. Use a fork or your fingers to gently prise the fruit away from the stalks. This can be a bit fiddly but you don't have to be too perfect with it - a few bits of stalk will not matter. Wash the fruit in running water and put it into a large saucepan. Add a little water. Cook them gently until the juice runs out. 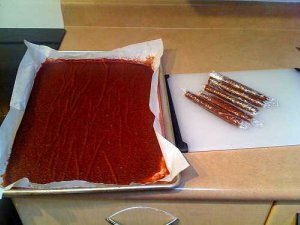 Now use a jelly bag or other way of straining them, such as a piece of muslin placed over a sieve. Strain off all the juice. You can leave the fruit in the bag or sieve for a while to drip so that you extract most of the goodness. You can also press them with the back of a spoon. Now measure the juice and add a pound of sugar for every pint of juice. Boil this mixture, stirring carefully to avoid burning the sugar. When it is the consistency of a thick syrup (usually about ten minutes), pour it into small sterile bottles and seal with a close-fitting cap. You can add a few cloves to help preserve the mixture but it's not strictly necessary. You can easily add elderberries to other recipes involving fruit. For example, you can add a few in with blackberries when you make a blackberry pie. I haven't tried making a pie with just elderberries, yet. Elderberry jam is easy to make. Use the instructions for blackberry jam. Jelly tends to be nicer and less bitty. Use a piece of muslin to strain the elderberries before adding sugar. Elderberry coulis is also very easy to make. Here's another good reason for having an elder in your garden or yard, besides looking after the birds! If you don't have one at home they are easy to find in the countryside. They grow commonly in mixed woodlands and some hedgerows. This one is an elderflower recipe, rather than an elderberry recipe. Elderflower champagne is just delightful at the time it comes available (May - June in Britain). It is a lovely thirst quenching and explosively fizzy drink made just from elder flowers, water, sugar and lemons. The natural yeasts on the flowers are responsible for its fizz and sparkle. Kids often love it, though it may take a little getting used to, especially if they are more accustomed to coke or other commercial soft drinks. It's also great fun for them to make, especially because it can become so explosively fizzy. Parents should be aware that there may be a trace of real alcohol in the finished beverage. Take 6 to 8 large heads of elderflowers in the middle of the day when they are fully open. It's good to pick in sunny but dry weather; if it's at all cloudy elder flowers can get covered in thunderflies, which may make some people a bit squeamish! Wash them carefully and remove the stalks. I find it's easiest to do this with a fork. Run the fork through the flowers and the individual flowers will fall off. (If they resist, they probably need another few days to mature.) Don't worry if there's still some green stalklets attached when you have finished; a few won't spoil the flavour. Put the flowers into a large bowl or pan and add 8 pints (4.5 litres) of filtered water and a pound and a quarter (500 gm) of sugar. White sugar is needed here as the flavour of elderflowers is quite subtle and easy to overwhelm. I haven't tried using fructose instead of sugar but I should think that would work too. Add the juice of two lemons and their peel to the mixture and stir everything well. It's best to use unwaxed, organic lemons where possible. Finally, add a couple of tablespoonfuls of white vinegar or cider vinegar to the brew. Cover the pot or pan and leave it for 1 to 2 days or longer. You should notice a ferment beginning. Filter everything through a sieve or piece of muslin. Use recycled plastic bottles for the finished "champagne" drink. Store it in the fridge. The bottles may swell rather alarmingly with the pressure after a few days so don't keep it too long. It's a good idea to release the pressure every day or two to stop it building up too much. Be very careful if you use glass bottles (not recommended) because of the danger of bursting. One family I heard of went away on holiday after making their elderflower champagne. They came back two weeks later to find it splattered everywhere throughout their kitchen! I find elderflower champagne stores quite well and safely in the freezer - in plastic bottles. We cracked some open at Christmas one year. Leave some room in the top of the plastic bottles for the liquid to expand as it freezes. If you are in a hurry and your elderflowers look clean and bug-free you can make it without washing the flowers. The ferment will be a lot faster as there will be more wild yeast present in the mix to start. You shouldn't have any trouble drinking it within a few days, especially if you add ice and gin! Children like it on its own or with a dash of blackcurrant. If you have any interesting elderberry recipes to share - or any easy organic recipes, please use the Add a Tip page near the top of the nav bar. Thank you. I'd be particularly interested in elderberry recipes for Pontack sauce from someone who has actually made it. It's on my list of things to try making.